A farm in the Napa Valley raising quality llamas and providing sales, support, llama services, tips, and 4-H/Youth information. Located in Napa, CA, USA. Small directory of photographers in the Napa Valley. napas on demand delivery service, serving napa and the bay area. Manufacturer and distributor of industrial gloves and personal protective equipment. Weddings, reunions, parties, special events, documentaries and memorials. Napa Valley. Specializing in sign fabrication, graphics and environmental design and sculpture. Napa, California. Community banking services for Contra Costa, Almeda, Napa, Placer and Marin Counties. Provides auditing, accounting, tax, consulting, and planning services. Offices in Napa, California and Waianae, Hawaii. Provides triple net leased properties for 1031 exchange replacement property solutions. Offices in Napa, CA and Austin, TX. Practices primarily in San Francisco, Marin, Sonoma and Napa counties, from office in Mill Valley. Serving the Sonoma and Napa County regions of Northern California with mobile, on-site destruction. Photography in the Napa Valley and Bay Area with a photojournalistic and fine art approach. Providing portraits, boudoir, and hand colored photographs. Community bank delivering its services to Napa Valley, California. Helps clients achieve organizational business alignment via out-of-the-box thinking and world-class leadership development. Offices in California, USA. Aerial photography systems with blimps, towers, masts and balloons. Photo, video, and 90 MPH balloon surveillance systems. Based in Napa. Manufacturers of PVC and polylam stock and custom wine capsules and spirit closures. Includes product and company information, and services available. Based in Napa, California. 47 G&J Seiberlich & Co LLP, CPA Napa, St. Architectural and Fireplace Cast Stone products, Our goal is to give todays architects, designers, and builders access to quality and craftsmanship. Full-service production company, specializing in Event & Wedding Videography. Utilizes professional audio/video equipment with the ability for multi-camera productions and DVD mastered videos. Offers a selection of olive oils from Italy, Spain, Greece, and California for foodservice and retail. Includes characteristics and uses for each type. Located in Napa Valley, California, USA. Villa Mille Rose is a small organic producer based in the Napa Valley, California. The site has short descriptions plus an order form. Select wines from Napa, Sonoma, Washington and Australia. Bottle etching services. Hardware for the kitchen, bath and furniture. Includes a search option, FAQ, and company information. Offering Cabernet Franc, from the Napa Valley in California. Sells a selection of rare Napa Valley wines. 60 Sonoma Sausage Napa, California. Napa, California. Offers ethnic pork, beef, and chicken sausages. Specialized breeders of rare boas and pythons, as well as Asian ratsnakes. Producer of a 1998 Napa Valley Cabernet Sauvignon. Also offers information and a wine club. Located in Napa, California, they offer abstract and expressionist paintings, sculpture, and prints. An assortment of flavors including some made with beer, wine, fruit, garlic, or horseradish. Flavored and extra-virgin olive oils, mustards, tapenades, and vinegars. Ships in USA. Locate hard to find wines through this Napa Valley retailer. Includes information and a catalog with descriptions. Charles Feils aerial photographs of Maine, Florida Keys, Vermont, Massachusetts and Californias Napa Valley. A winery producing Merlot, Bourriquot, and Syrah from the southern Napa Valley and northern Carneros regions. Shipping within the US. Canadian manufacturer and importer of shearling outerwear. Featuring designer collections from Dominic Bellissimo, Christ Leather and Sawyer of Napa. Offering wine, oils, mixes, nuts and gift baskets featuring gourmet products from the Napa Valley. Napa and Sonoma vineyards with a broad range of varietals. Offering novelty coins and coin collectibles. Specializing in Sonoma and Napa county wines. Grapeseed oil made with the cold-press method. Includes a list of retailers where the product may also be purchased. Biodynamic and organic lavender bath and body products grown in the Napa Valley. Country, ranch, & Southwest style furniture and home accessories with stores in Marin, Sonoma, & Napa County, serving the San Francisco Bay Area. Offers gourmet sauces, mustards, tampenades, rubs, vinegars, oils, and baking mixes. Includes recipes, menus, gifts, and newsletter. Select two, or three bottles per month from boutique and cult wineries of Napa, and other California wineries. A monthly newsletter is included. Isabelle Saint Guily practices acupuncture and herbal medicine in Napa. Private custom tasting tours of Napa and Sonoma Counties in California. Includes sample itineraries and an information form. Services Napa Valley. Weddings and vow renewals available. Offers daily scheduled Napa Valley tours as well as custom tours of Sonoma and Napa valleys. Contains itineraries, fleet descriptions and rates. Creates winery, vineyard and historic tours in Napa Valley, California. Contains sample itinerary and menu. Flights over Napa Valley. Photos. flight descriptions, 3-D virtual flight. Brings together those who study, appreciate, and take pleasure from the wines of the Napa Valley. Offers courses on functional manipulative therapy. Southern Napa producer of Merlot, Bourriquot, and Syrah. Rates Napa and Sonoma wineries and creates customized itineraries. Guide to Santa Ynez Valley wine tasting routes, accommodations and food. Produces wines from Napa Valley. Contains a brief description and contact information. Small Napa Valley, California breeder of Ocicats with a focus on quality, not quantity. Andre Tchellicheff protege, Jill Davis, is the winemaker at this Napa producer. Napa. RV & tent sites, boat dock and launch. Producing wines from two different Napa valley vineyards. Tours and tastings by appointment, online shopping. Producing limited quantities of Cabernet Sauvignon in Napa. Contains company information and a chat room. Source grapes and wine from vineyards and winemakers in California to produce Napa Valley Chardonnay and Merlot. Produces Zinfandel and Sauvignon Blanc in Napa. Contains product descriptions, online ordering, and information about the founder. Lessons from beginner to professional in slalom, jump, trick, barefoot and wakeboard. Near Napa Valley. Lake Berryessa, CA. Produces organic reds and whites and provides winemaking facilities for 60 wineries. Includes product and company information, along with ordering from many producers. Family owned and operated winery in Californias Napa Valley. Offers a newsletter, recipes, articles, and an order form. Produces Kosher red, white, and sparkling wines in Napa. Includes a newsletter, award list, recipes, and online ordering. Produces red, white, and rose wines in Napa. Includes product details, online ordering, and a company history. Information about this private practice, services, insurance fees and appointment scheduling. Located in Napa, California. Guided, interactive day trips in Californias Napa, Sonoma, and Livermore Valleys. Includes a photo gallery, event calendar, and links. Organization of more than 180 local wineries presents a winery finder, regional information, descriptions of winemaking, and event listings. Visitor information, things to do, wineries, dining, shopping, and lodging information. Cyclocross information, training guides, and schedules from the Napa Valley Velo racing team. Offers tours in Napa Valley and Sonoma. Includes descriptions, lists of available activities, and menus. Cabernet Sauvignon specialist with vineyards in Alexander and Napa valleys. Offers product descriptions, videos, a newsletter, a 'personal cellar,' and a company overview. Makes Chardonnay, Pinot Noir, and Gewurztraminer in Napa. Includes product descriptions, reviews, online purchasing, marketing materials, and a company profile. Producer of sparkling wines offers information about products, tours, events, and the company history. Also has online ordering. Owned by Allied Domecq. Based in Napa, Ca USA, this business offers services to alleviate constipation, digestion problems using Colon Hydrotherapy. Limousine tours of Californias Napa, Sonoma, Dry Creek, and Alexander Valleys. Contains travel tips and a reservation form. Biking, walking and kayaking in the Napa Valley and Sonoma, California and Hawaii. Offices in Calistoga and Petaluma, California. Specializes in reds, with locations in Mendocinos Redwood Valley and Napa Valleys Spring Mountain. Features product descriptions, online ordering, and a company overview. Produces a range of red, white, and sparkling wines. Includes product descriptions, online ordering, reviews, recipes, and a company overview. Formerly known as Codorniu Napa. Home of American Paint Horse Association World Champion The Will To Do. Standing sorrel overo at stud. Includes photos and profile of stallion. Located in Napa. Friesian horse breeding and sales using both domestic and European approved Friesian stallions as sires. Located near the Napa Valley in Northern California. Provides customized private and group escorted tours in Californias Napa and Sonoma counties. Includes rates and a photo gallery. Including schedules for upcoming meets, past meet results, photos, news articles, and forms for club participation. Produces a range of reds and whites in Napa. Includes product descriptions, ordering, pictures of the winery, a winemaker profile, and a company overview. Producers of Cabernet, Chardonnay and Merlot, with vineyards in various Napa Valley locations. Includes information about the wines, vineyards, and tasting room. Organization that rescues dogs in need, placing them in qualified adoptive homes. They also work against breed discrimination throughout the United States. Based in Napa, California. Custom-designed wine tours, appointments for hot air balloons, biking, golf, hiking, art tours and culinary classes. Family-run winery produces Chardonnay, Cabernet Sauvignon, and Merlot in Napa. Contains details about wines, staff profiles, published reviews, and an order form. The oldest continuously operating winery in Napa Valley was also the first winery to offer tours to guests back in 1934. Includes newsletter, wine club, and entertainment ideas. Specializes in private limousine tours of Californias Napa and Sonoma regions. Provides sample itineraries, prices, and a reservation form. Also lists local wineries and tourism resources. Annual event in Napa Valley with tastings of wine poured by dozens of home winemakers and silent auction of vintage wines. Provides information on this Napa, California charity event. Specialized tours of Californias Napa and Sonoma regions, including itineraries focusing on historical and family-owned wineries. Includes tour descriptions and contact information. Producers of Pinot Noir and Merlot wines from over 150 acres of sustainably farmed vineyard in the Carneros region of Napa Valley. Site describes wines and winery, staff, culinary events. Online ordering available. Situated on Lake Berryessa adjacent to Napa Valley. Information on cabin rentals including photos and rate information. Gourmet Retreats at CasaLana B&B offers cooking classes ranging from 3 hours to 5 full days. Classes are held in Napa Valley in the B&Bs professionally equipped kitchen. Offers guided tours and corporate events in Napa Valley, California. Also offers tours in Australia, Europe, and South America. Includes information about services and the company. Includes members web pages, newsletter, a disk of the month, and other resources. An Ultima Online (Napa Valley and Pacific) guild and Star Wars Galaxies player association. With laws, message board, and members area. spiritual weddings in sonoma and napa counties. fees listed. Napa Valley, California. Includes class and event schedules. Gives map and worship schedule. Includes articles as well as information on ministries, fellowship and clergy. serves sonoma, napa, and marin counties. includes information and resources, marketing offers, and forum. dr. judith caldwell provides personalized weddings and other ceremonies throughout napa valley and beyond. About the uncaught serial killer who terrorized Napa and the Bay Area in the 1970s. sonoma-based firm also serving napa and marin counties. includes photo gallery, client comments, and clients-only planning calendar. robbin montero, serving sonoma and napa. information on services, informative articles, and reasons to get a wedding consultant. san francisco and napa. mediation, arbitration and litigation support services for construction, building, and design disputes. details of services, contacts. 220 Saint Apollinaris Catholic School Napa, California. Napa, California. Accredited parochial K-8 school. Contact information, mission statement, admissions, staff directory, student activities. Specializes in black and white landscapes of the Napa Valley, California. group meeting in napa, california. letters from officers, brief information on meetings and membership. portfolio of bouquets and arrangements created by napa-based designers emily mclain and billy meng. Offering a murder mystery dinner theatre, mysteries and interactive plays and comedy in Napa Valley, California. colorful virtual galleries of abstract watercolors by napa valley, california artist thomas morphis. award-winning author of contemporary romance featuring exotic settings such as greece, napa valley, arabia, and argentina. jane porter is known for great drama and complex characters. SiteBook Napa City Portrait of Napa in California. 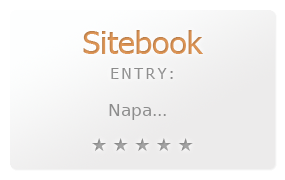 This Topic site Napa got a rating of 3 SiteBook.org Points according to the views of this profile site.